Blueberries are one of the healthiest fruits around; they are low calorie, almost fat free, packed with vitamin C, antioxidants and dietary fiber–and they taste wonderful. As if that weren’t enough, they can add striking beauty to your garden. Whatever your reason for growing them, blueberries will work very well in your landscape plans. In addition to the fruit they produce, they have beautiful bell-shaped blooms in spring, handsome glossy foliage in the growing season, striking fall color and bright red stems in winter. They are very low maintenance and easy to grow!! Berries are packed with plenty of essential nutrients your body requires. Vitamins A, C, E, K, B6 and B12, which you probably already know have tons of health benefits. Another major health benefit of berries is their immunity boosting capabilities. In addition to keeping your defenses high against general illnesses, berries also improve heart health. These antioxidants also balance blood fat levels, which helps regulate high cholesterol. Other antioxidant health benefits of berries include its ability to fight certain types of cancer. The high amounts of manganese found in all berries are especially helpful in flushing out the digestive system of toxins. Blueberries are easy to grow, require little care and are seldom bothered by pests. They can vary in size from low ground-covering varieties to large bushes ranging 4-6 feet high. Their versatility allows them to be used as background shrubs or as border plants. They even make excellent hedges, if spaced correctly. If you are limited in space or just have a patio, consider planting them in containers. Different varieties of blueberries produce different sizes of fruit, with flavor ranging from tart to very sweet. Larger fruiting varieties produce fruit perfect for fresh eating and large desserts, while smaller fruiting varieties are better for adding to cereals, muffins and pancakes. The Southern Highbush varieties of blueberries are especially suited to our Southern California climate. Be sure to select different cultivars to lengthen your harvest season from June until the end of August. For blueberry lovers, we suggest at least two plants per family member. By growing early, mid, and late-season varieties you can harvest blueberries from early summer until fall. Blueberries ripen over a two- to five-week period. Harvest highbush blueberries every 5 days as the color becomes a deep blue. 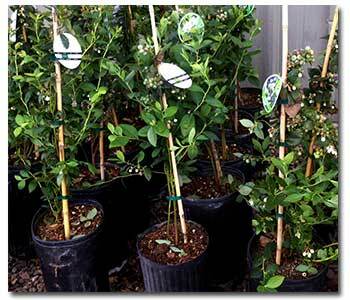 Blueberries can be planted almost any time of year in Southern California. Cultivars suited for for this region include Misty, fruiting as early as April. Early-flowering Reveille is harvested May through early July. High-yield Sharpblue harvests through June and July. There are a few varieties such as Ozark Blue which yield late season August berries. Due to the mild climate it is possible to have an extended season with fresh berries all year. See our Step-by-Step planting guide for blueberries. Blueberries grow best in a sunny location. They tolerate partial shade but produce fewer blossoms and fruit. Blueberries should not be planted near trees or crowded by other shrubs. Blueberry bushes live 30 to 50 years, so it is wise to give them adequate space to spread out. Good air circulation helps prevent fungal diseases. Highbush blueberries need 4 to 6 feet between plants, and the smaller half-highbush require 2 to 3 feet. Blueberry bushes come into full maturity in their fifth or sixth year, producing 5 to 10 pounds of fruit per bush. They prefer a light, airy acid soil (with a pH level of 4.0 to 5.5). Adding 50% peat moss or “add” G&B Acid Planting Mix to each hole is highly recommended. By adding organic compost or peat moss as a soil additive, it will lower the pH factor to an acceptable level. Blueberries like to stay moist but not wet. If your soil does not drain well, consider building a raised bed to plant them in. Mulch around your plants about 4 inches form the main trunk to prevent weed growth and retain moisture. Fertilize twice a year in early spring and again in late spring/early summer with cottonseed meal or an another acid-inducing plant food such as. G&B Rhododendron, Azeala, Acid Loving Fertilizer. Prune during the dormant season. Starting in the fourth year, remove dead and weak branches. Thin out branches smaller than the diameter of a pencil. As the bush ages, remove old, unproductive branches to stimulate new growth, leaving 6 to 8 productive branches. Prune interior crossing branches to admit light to the center of the plant. Besides their amazing health benefits and taste, they are easy to grow! So why not grow your own blueberries! We love blueberries and invite you to add them to your garden. Check your local Grangetto’s or nursery for availability.